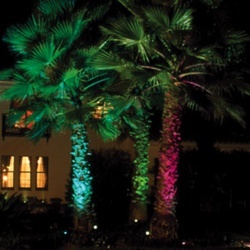 Safe, super bright, energy efficient halogen OR vivid color LED lighting! Your gardens, water features, and landscaping come alive at night with state of the art low voltage, energy efficient LED lighting. Compact fixtures so small that they're hardly visible. These compact fixtures focus the light where you want it. LEDS operate with seven solid colors--red, green, blue, white, yellow, aqua and purple; choose any color or cycle through all seven colors using your wall switch.